HEAD & SHOULDERS TOP OR BOTTOM? With all the talk of head & shoulders top, which everyone sees by the way and thus is unlikely to play out, I thought I might throw out a slightly different interpretation. I wonder how many people see the inverse head and shoulders pattern that might be forming. I haven’t heard anyone talking about that, which probably makes it a heck of a lot more likely than a straight collapse predicted by the vast majority. I already showed the reasons why we should expect a major bottom soon in the last post. Heck we didn’t even break to new lows today and we do have another intra-day reversal so it’s entirely possible we got the low yesterday. If this unfolds, how many bears are going to get destroyed…again? I suspect quite a few already took a beating trying to sell into the February bottom. If the level of traffic on the blog at the time is any indication the bears lost a lot of money on that wrong call. Like I’ve been saying for months and months why would anyone want to trade this manic market? You are just asking for pain either long or short. The only market that is still in a secular bull is the precious metals market. In that sector you have the luxury of a safety net under you. Any mis-timed entry will eventually be corrected by the bull. This entry was posted in Uncategorized on July 2, 2010 by Gary. You should be careful not to use the word ‘will’. Let me remind you that none of us has ANY idea what ‘will’ happen, only what ‘could’ happen. I would not call the jobs report “good”. Maybe better than expected but certainly not good enough to cause a huge short covering rally!! No the jobs report was minus 124,000 that’s not good. +500,000 would be good and it would have caused the market to gap up. Okay Gary. If that’s what you really meant then I can see your point. LMFAO!! OK….we’ll see I guess! 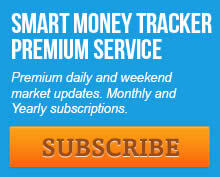 You raise some good points regarding the market’s test of the 75-week SMA and the 38.2% Fibonacci retracement. It certainly seems like we’re due for some kind of bounce. But I have to take issue with your suggestion that an inverse H&S could be forming. There is no head, there is no right shoulder… there are only three red lines you’ve drawn in. You’re simply imagining what could happen, long before there is any evidence to support your supposition. What we do have is a messy H&S formation with a confirmed break of the neckline. It could still fail, but that’s all we know right now. LOL of course I’m just guessing. But we do have a bounce out of the now due intermediate low coming so we will start forming the right shoulder soon. Whether or not the rest of the pattern plays out is anyones guess. I’m just trying to point out that everyone seems to have jumped on the bear bandwagon (much too early in my opinion). And if everyone is thinking the same thing then no one is thinking. “Like I’ve been saying for months and months why would anyone want to trade this manic market? You are just asking for pain either long or short. The only market that is still in a secular bull is the precious metals market. And this bullish signal has a 96% success rate which means we should see at least a 10% new high within 12 months. It also predicts the short term weakness in the first 6 months exactly like we’ve experienced. BTW do you realize your chart is for 2007. Are you trying to predict the 07-09 bear market? If so you are a little late aren’t you? What I’m hearing from Gary is simply that gold is the best probable bet. He’s helped me make great returns so I’ll stick with that message and buy dips in gold (maybe other PM’s too, but gold seems to hold up best). I agree that stocks are more likely to bounce than collapse right here, but that is not the highest probability trade, which continues to be long gold. Enjoy your holiday folks, and rest easy that gold will lose you less, or make you more, than any other trade. It will probably end up being like the H&S that didn’t play out May/June of ’09 which everyone expected. But now the inverse may be more expected so IT might not play out. Bottom line for me is that the only H&S pattern I play is the one forming on 2-5 minute bars intraday. Man, talk about over-thinking. Everything said is nice for a cigar and a scotch, but its all a coin toss. If we are talking cigar and scotch discussion,perfect! If we are talking real life, forget it. Ps nothing works for gold, except looking in the rear view mirror….if it did work we would all be traders. Buy gold, and enjoy the holiday. If you haven’t learned your lesson about gold by now then you apparently can’t learn. Just accumulate and let the bull do his job. why do you think everyone has jumped on the bear wagon and why do you think its too early? to be fair, you were skeptical of the stock market as it ran up in March and April 2010. Then exactly as it was about to top out late April you predicted a runaway stock market. I remember the day I suggested that the top is in you were brushing that off here on the blog. Now you predict that a market low is almost here, and you see’turn arounds’ the last two days, ignoring that the markets actually feel; in a reduced speed, yes, but to call this turn arounds doesn’t really make much sense. I can see a h&s pattern; I really cannot see your inverse h&s; perhaps with some clearvoyance and a lot of imagination, but technically I believe in what I see and not in what some one imagines. It is fact that ALL the leaders internationally – the Chinese, Brazilian, and Indian stock markets – have ALL made a death cross. The European leader, the FTSE, which is also a leading stock market indicator for the US markets has also made a death cross. Death crosses alone have a limited voice, but in such mass and in combination with other bearish patterns (like the h&s) they are very meaningful. I give you credit for your expertise of the PM markets. I can tell that you are doing your homework. As for the stock markets however, you really should hold your horses, because I believe you are putting yourself against the wall and risking huge embarassment; and that you are writing under various pseudonyms (Gary, Toby) means probably that you don’t want to risk personal embarassment. I suggest you are a bit more cautious with your predictions. Yes, PMs and PM stocks have been the best investment since November 09, but with the stock markets tanking and quite possibly tanking much further, you don’t really think PMs will take off into your C wave top? Yes, people are way bearish now. You consider that a contrarian signal, and usually I would agree with you, but contrarian investing is not as simple as that. If it were, then gold should have temporarily topped, because people are extremely bullish on gold. As for the stock markets, the bearish sentiment is still just an unwinding of the bullsih extremes we saw in April. Sentiment was also very bearish on the stock markets in October 08, but that wasn’t a contrarian indicator. Stocks still fell almost another six months. Again, your thoughts on PMs are good, but you can’t isolate those from what is going on in the stock markets; your calls on the stock markets for as long as I follow your blog (since earlier this year) have not been convincing. Sorry to be so blunt. (1) Though the market did not make a new low, it found value (high volume areas) about 1% lower than yesterday. It closed near its lows. I too was not expecting this break ES 1020 but it did, in spite a lot of the big guys not willing to press shorts right now. (2) We have a confluence of 38% Fib supports (the Bear Plunge and the Cyclical rally) at this level. However the absence of a bounce can not be ignored. (3) On a weekly basis we have a break of the DeMark TDST support levels across all the indices, even the Russell 2K. This is typically the last to go but it has gone. The break is very early in the Sell Setup (1st of 2nd bar) which typically means that it will continue to setup completion (9 bars). Historically a downside break of the Weekly TDST level has signaled a bear market. (4) There has been a breakdown in economic indicators with most reports coming worse than expected. The decline in ECRI’s Weekly leading indicator is one of the strongest ever; all prior occurrences were either in or just before a recession. (5) There are enough bulls like Laszlo Birinyi and the usual big bank strategist still blowing the bullish horn. However money is flowing out of equities; the big funds do not have much dry powder left. With tax hikes about to come, tax related selling will also pick up pace for people sitting on huge gains. In spite of two weeks of persistent selling, the breadth oscillators are still higher than the Feb or Nov lows, and way higher than the May-June lows. It is not truly oversold, yet. The oscillators on individual indices are also well above prior lows. (6) That article from MS on 52 week ROC, has got its predictions wrong already; it is taking about monetary tightening as the catalyst when it is the reverse which is going to happen. There are other stats which show that if 52 week ROC > 50% but then falls below 30%, it invariably will go to 0 or below. The fate of equities, dollar and Gold will be decided by the politicians in Washington. They are less likely to run up more spending prior to the mid-term. The market is now seriously pricing the possibility of a double dip, with its deflationary connotations. Looking at the hourly charts of Gold, this was a wedge break-down and the resolution target is around the 1155 area. That is close to the 150 Day SMA the line of support of the bull. I’m just basing it on the fact that all I hear all day long on CNBC and on virtually every blog is head & shoulders top. Don’t forget in June and July of last year the Fed aborted a left translated 4 year cycle. That has never been done in all of history. I think I had very good reason to be skeptical. We obviously did experience a runaway move out of the Feb. bottom granted I thought it might last a bit longer than it did but I was telling everyone from earlier April on that sentiment had reached extremes. We appear to have a miscommunication going on. I don’t have a storng opinion one way or the other as to whether the bear is back. I would prefer to wait for all the signs to come in before passing judgement and even then I’m not going to be stupid enough to trade it. You on the other hand appear to be dead set that the bear is back and the end of the world is just around the corner. I have to ask what’s the big hurry? If the bear is back and you are masochistic enough to attempt to trade it, there is plenty of time to do so. Just wait till the counter trend rally unfolds and sentiment gets too bullish and then sell short. Just basic bear market strategy. You don’t sell short this deep into a intermediate decline that’s not a high probablity trade. As a matter of fact its the exact opposite of what most traders do in bull markets. They buy high and sell low. Do you really want to sell low and buy high in a bear market? Agreed. And I am not trading that market right now. I think trading is gambling and I have already made enough trading mistakes in the past. I wrote what I wrote because I interpreted that you lean towards a big bounce in the markets to come, and I just don’t buy that; but your response makes sense to me. I think the most important chart in the last post is the intermediate cycle chart. Even in a bear market the bounce out of an intermediate cycle low tends to be large. So yes I am expecting a significant bounce even if we have entered a bear market. Whether it comes next week or in three weeks is anyone’s guess although the daily cycle is now going on day 40 and the cycle rarely lasts longer than 43-45 days. Couple that with the fact that sentiment is again at bearish extremes and I think the odds are on sooner rather than later. Blah….still too much chatter. We are setting up to a bunch of justified people who will be disappointed when thing tanks. Yuck. This blog is really getting horrible with too much justified horse crap. Get ready for another 20% drop in the US averages. Annoyed by the BS going on in the blog at this point. Really is a bunch of crap!!!! Yes all your tech points are garbage. Gold is set to go up, Yes! US averages are set to go down, Yes! The rest is a bunch of horse crakp even suitable for spoil. FYI to the other posters… the odds that gold will go straight back up after what just happened to gold are about zero. That was a huge red candle. Yikes. Some serious short term technical damage was done to gold. The nearly perfect cup with handle pattern totally failed. Now every rally is going to be sold for a while and gold will sink lower and lower short term. Gold will probably be in no shape to retest all time highs until September or October. And if the market really tanks you had better believe that all assets (including gold) will get sucked down with it, just like 2008. I have been watching gold every single day since 2002. If I had to guess I would say that we will see gold at 1165 or lower before we see gold over 1300. 1165 may not seem very far away at the moment but it WILL seem painfully low and disheartening when the time comes, and it most likely will not pop over 1200 again without a real struggle. In other words, be prepared to deal with sub-1200 gold for 2-3 months. And if things get really ugly in the market, perhaps longer. Just my two cents. Longer term I am still bullish gold of course. You could be right, but I’ll take the $1165 downside vs. $2000, then $3000+ upside every time, even if I have to wait a few months for upside to resume. We focus too much on the very next move, which is highly unpredictable, IMO. It is exactly this continued attempt to “read” the bull that keeps traders from making money. Trust me folks the bull will not be “read” when you think he should go down he will fool you and go up. When you think he’s going up for sure he goes down. The only way to tame this tricky animal is to just hold onno matter how hard he bucks. And don’t forget in bull markets the surprises come on the upside. The way it looks to me is we just broke down from a h & s top formation. Your silly lines drawn in could be drawn anyway. Look at what just happened. This blog is becoming more of a joke everyday. I am glad I do not pay for this kind of advice. Buy and hold fools. Weren’t you saying the same thing back in Feb.? How much money did you lose on that one? Sheesh can’t you see that Gary is just showing you an alternative the “might” happen instead of your mindless H&S, end of the world is here nonsense? Sheesh where do these kooks come from? I believe G has been saying all along that he’s not sure if the bear is back or not, and that a rally now could very well end up being a bear market rally. I think people are a little too hard on Gary. You posters are looking for advice on some guy’s blog. The guy is obviously not a multimillionaire so… what kind of excellent advice are you expecting? At best he knows a little bit more than the rest of us. You are looking for financial advice from someone who is not wealthy. Good luck with that. That’s like taking dieting advice from a fat person. What do you expect?? The guy’s calls are not going to be perfect. As a rule most self made multimillionaires do not have ‘blogs’. They are too busy studying and/or sailing. LOL I know several millionaires that have or are in the process of losing all their money. Wealth doesn’t make one clairvoyant more than anyone else. This has to be the all time stupidest post ever. It looks like the fleas are out in force. The must still be pissed that Precther shorted them into bankruptcy all the way from 950 to 1220. Meanwhile the rest of us have been making moola riding the bull. Yi haaa! I’ve given up trying to understand what the “flea’s” problem is. Apparently he just isn’t happy unless he’s bashing someone. Yes, a chart from early 2008 showing the same setup and signal as was given as of this week’s close. Pull up a current weekly chart with the same moving averages and you will see the same signal given now as during the first week of 2008 (and back in year 2000). There is no guarantee it will work out the same way this time, but I’d estimate a 2/3 or better probability that the market is in for a major decline without any move above the S&P’s 1131 high first. Of course lots of people see potential head and shoulder setups as they form. They often work out. They often do not work out. If your potential inverse head and shoulder pattern were to form, do you not think ‘everyone’ would see that too? The signal I am speaking of is given by closing more than marginally below both long term averages, and has nothing to do with the head and shoulders pattern. I would rather taking dieting advice from a bodybuilder than from a fat person. If you can’t see the rationale behind that notion then… there is really no hope for you. Sure, rich people go broke and poor people get rich. It does happen, but not as often as you think. Both instances are very rare but the media hypes either case when it does happen and it causes people to think that it is more common than it actually is. I know five honest to goodness multimillionaires and in the 20 years I have known them, not one has ever gone broke. Not even close. They are all still very rich. You guys need to get out more and start meeting real wealthy people in real life. Just because you read about some millionaire online somewhere who lost his money does not mean it is common. That is very uncommon in real life. Here is what Gary wrote.. Things is, the market is made up of millions of participants, and the majority would never have even heard of a ‘head and shoulders’. The market just lost nearly 10% in a little over a week. I’m quite happy I got all of that, it was plain as day the market is running out of steam, and newsflow is following the market down. I am more afraid of missing a 20% crash than any ‘imagined’ bounce to new highs. We have had the ‘death cross’, the 200 day MA is close to pointing down, and still Gary denies the bear is back. He may know his gold bull, but he has no idea of equity markets, none whatsoever. If you want useful market stuff check out Daneric’s site, he’s been spot on since January this year. Some easy money to be made over the summer, I am praying for a bounce to SPY 1070, but I’ll be shorting from 1040 again. Actually the market closed significantly below the 65 week moving average five times from 1982 to 2000. None of them signaled a bear market. Only the last two times in 2001 and in 2008 did. So historically your observation of a close below the 65 week moving average has a 28% chance of success. The supposed death cross occured 6 times from 1980 to 2000 none of those signaled a bear market either. So all this talk of the 50 crossing the 200 sealing the fate of the market also doesn’t stand up to historical review. Now maybe this time the 65 week moving average close and death cross will signal the start of another leg down in the secular bear. No one knows yet. I’m just not in any hurry to jump on the bear band wagon just yet, and even when I do there’s still no way I would be stupid enough to try and trade it. Have we forgetten already the Ben abort a left translated 4 year cycle with his printing press in `09? He’s clearly proven he can halt (if only temporarily) a bear market in asset prices. Why would anyone want to take huge risk for small profits in a bear market that is going to be constantly tortured by the efforts of the Fed and government. Just wait till they institute short selling bans? One would have to be crazy to fight with a bear under these conditions, especially when there are huge profits to be made by simply riding the secular gold bull. These perma bears are just hilarious. They never bother to mention they are still underwater from trying to call the top in March and April or that they got caught in the runaway move out of the Feb. low that they are still struggling to get even. Gary from UK you just keep making these imaginary profits, meanwhile the rest of us will just keep making real ones riding the bull. This is exactly the same rhetoric we saw at the Feb. bottom. I think the bears are about to make the same mistake twice. If you want to use the same technique during a secular bull market as a secular bear market, you are not likely to be particularly successful doing so. 1982 to 2000 was the longest secular bull market the U.S. has ever seen. I expect that the secular bear from year 2000 will remain in force for at least another couple years, perhaps several, and look for a Gold/Dow ratio (not Dow/Gold as I prefer looking at the chart inverse to what most people do) of about 0.5 to 1.0 by the time it is done. I use a couple additional criteria for the signal, one of which has also triggered, making the signal more likely to be accurate, while the second is pending and will take a few weeks to potentially trigger. Naturally, it is not an irreversible signal, and a weekly close above the 200 day average (or equivalent weekly avg.) 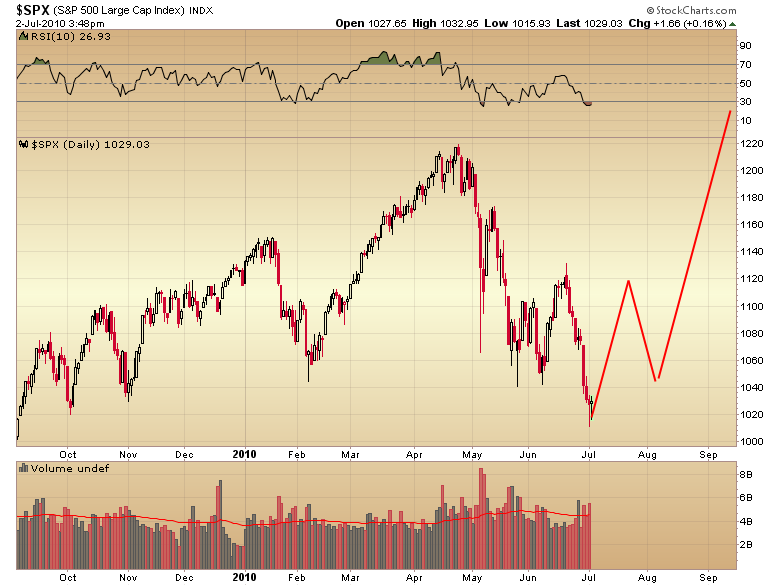 would indicate that another leg to new highs has then become the more probable next move for the stock market (rather than a substantial further decline). The job report was okay. We’re still recovering so it won’t necessarily be consistent month over month. The losses from the Death cross of late 2007 is already done last March. Any death cross we get this time will likely be temporary before another golden cross quickly reappears, just like May 1933.